You can change the position of a text box (and the text within it), shape, WordArt, or a picture by rotating or flipping it. Click the rotation handle at the top of the object, and then drag in the direction that you want. To constrain the rotation to 15-degree increments, press and hold Shift while you drag the rotation handle. When you rotate multiple shapes, they do not rotate as a group, but instead each shape rotates around its own center. When you rotate an inline object in Word, the object stays in the same position on the line during the rotation, which can make the rotation seem strange. If you don’t like the way it looks, you can change the layout option or text wrapping. 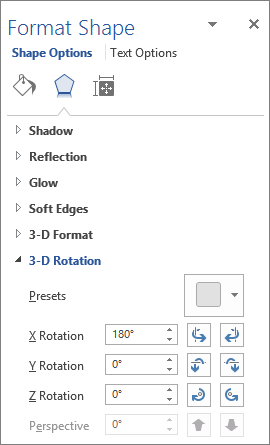 Under Drawing Tools (or Picture Tools if you're rotating a picture), on the Format tab, in the Arrange group, click Rotate, and then click More Rotation Options. 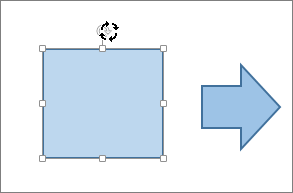 In the pane or dialog box that opens, enter the amount that you want to rotate the object in the Rotation box. You can also use the arrows to rotate the object exactly where you want. If you don't see the Drawing Tools or Picture Tools Format tabs, make sure that you've selected a text box, shape, or WordArt. You may have to double-click the object to open the Format tab. To rotate the object 90 degrees to the right, click Rotate Right 90°. To rotate the object 90 degrees to the left, click Rotate Left 90°. If you don't see the Drawing Tools or Picture Tools Format tabs, make sure that you've selected a text box, shape, WordArt or picture. You may have to double-click the object to open the Format tab. You can create the effect of a mirror image or flip an object upside-down (invert it) by using the Flip tools. To turn an object upside-down, click Flip Vertical. Tip: If you simply want to create a mirror image of text in a document, see Reverse text or create a mirror image. When you rotate an object, any text within the object will rotate with it. However, text within a flipped object is not automatically flipped with the rotation tool. To reverse text along with the object that contains it, you can do the following in Word, Outlook, Excel, and PowerPoint. Select and then right-click the object you want to reverse, and then click Format Shape. In the Format Shape pane, under Shape Options, click Effects. Under 3-D Rotation, in one of the Rotation boxes (X, Y, or Z, depending on how you want to rotate your text), enter 180. Changing the rotation may affect the fill color of your object. You can adjust your fill color in the Format Shape pane on the Fill & Line tab. When you click in the object to edit the text, it will revert back to its original appearance temporarily while you edit it. The reversed appearance will be reapplied when you are done editing text and you click outside of the object. Note: To constrain the rotation to 15-degree increments, press and hold Shift while you drag the rotation handle. If you don't see the Picture Tools, Drawing Tools, or Format tabs, make sure that you've selected a picture. You may have to double-click the picture in order to open the Format tab. 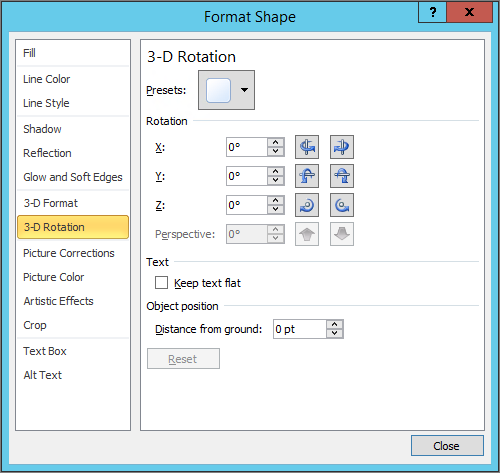 In the Format Shape dialog box, click 3-D Rotation on the left. In one of the Rotation boxes (X, Y, or Z, depending on how you want to rotate your text), enter 180. Changing the rotation may affect the fill color of your object. You can adjust your fill color in the Format Shape dialog box on the Fill tab. When you click in the object to edit the text, it will revert back to its original appearance temporarily while you edit it. The reversed appearance will be reapplied when you click outside of the object. Click the picture, shape, or WordArt that you want to rotate. Drag the rotation handle in the direction that you want to rotate the shape. Only pictures and shapes have rotation handles. Note: To constrain the rotation to 15 degree angles, press and hold Shift while you drag the rotation handle. To specify an exact rotation, first click the Format tab. Note: If you do not see the Format tab, make sure that you've selected the object. In the Arrange group, click Rotate , click More Rotation Options, and then on the Size tab, under Rotate, enter the amount that you want to rotate the picture in the Rotation box. When you flip a shape, picture, or other object, you create a reverse image of the shape, picture, or object. Tip: You can create a mirror image of an shape, picture, or object by making a copy of it, and then flipping it. Drag the duplicate copy into a position where it mirrors the original shape, picture, or object. Click the picture, shape, or WordArt that you want to flip. To reverse the object vertically, click Flip Vertical. To reverse the object horizontally, click Flip Horizontal. To rotate a SmartArt graphic, copy the SmartArt graphic, paste it as a picture, and then rotate the picture. If the rotation options are not available when you click the picture that you want to rotate or flip, right-click each picture, and on the shortcut menu, point to Text Wrapping, and then click Square or any option other than In Line with Text. 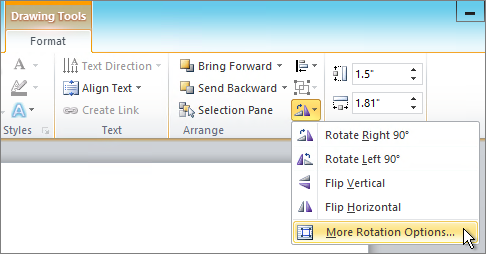 PowerPoint Online lets you flip an image horizontally or vertically. Other than that, Office Online apps don't have rotation tools. 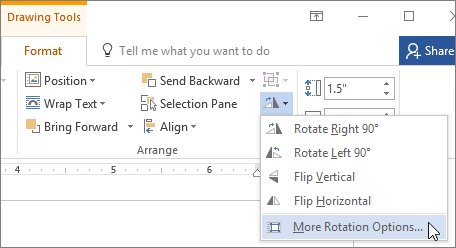 If you have a desktop version of Office, click Open in [Program Name] in your desktop program to open the document and use the rotation tools. If you don’t have a desktop version of Office, you can try or buy the latest version now. See the article Reverse text or create a mirror image. See the article Wrap text around a circle or other shape. Copy the table or SmartArt graphic, paste it as a picture, and then rotate the picture.